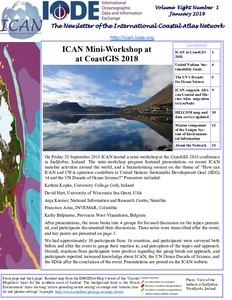 ICAN is a community of practice of organisations who have been meeting since 2006 to scope and implement data interoperability approaches to coastal web atlases (CWAs). 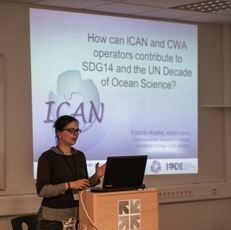 In 2013 ICAN became a project of UNESCO IOC´s International Oceanographic Data and Information Exchange (IODE) Programme. The mission/strategic aim of the IODE ICAN project is to share experiences and to find common solutions to CWA development (e.g., user and developer guides, handbooks and articles on best practices, information on standards and web services, expertise and technical support directories, education, outreach, and funding opportunities, etc. ), while ensuring maximum relevance and added value for the end users. ICAN members seek to play a leadership role in forging international collaborations of value to the participating nations, thereby optimizing regional governance in coastal zone management. A major goal is to help build a functioning digital atlas of the worldwide coast based on the principle of shared distributed information. The long-term view is for global-level operational interoperability which will evolve as the ICAN project members strive to increase awareness of the opportunities that exist for increased coastal and marine data sharing among policy makers and resource managers as strategic users of a CWA. Ensure that ICAN has representation from coastal web atlas development and user groups from across the world. Develop technical and policy guidelines to assist coastal web atlas developers in acquiring data and engaging with data providers. Accordingly, collate and publish a set of best-practise guidelines for the development of coastal web atlases. Highlight the benefits of interoperability and standards based systems to the coastal atlas developer communities. Develop collaborative projects for the sharing of know-how, implementation of technical solutions and demonstration of atlas benefits to users. Align the atlas efforts of the Network partners in order that interoperability can be facilitated. Engage with other relevant international IODE projects and developments as well as relevant activites outside of IODE. Involve representatives of the relevant user communities to help in tailoring coastal web atlases to their needs. To further these objectives ICAN has identified a range of activities in the areas of technical implementation, atlas assessment, outreach, training, and participation in scholarly communities, and strategic planning and funding. "...collections of digital maps and datasets with supplementary tables, illustrations, & information that systematically illustrate the coast, oftentimes with cartographic & decision support tools, all of which are accessible via the Internet."